Not only do electric vehicles cost literally cents per kilometre to drive, (or fractions of a cent per km with roof-top PV) but they also revolutionise car servicing. 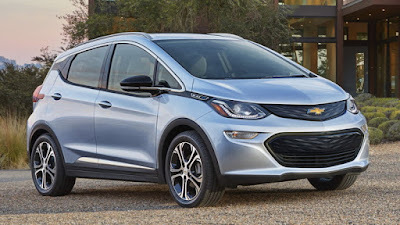 The maintenance schedule for Chevrolet's soon to be launched Bolt electric hatchback comprises tire rotation every 12,000 km (7,500 miles) but if a wheel alignment is performed with every new set of tires then rotation can be skipped which means the Bolt requires practically zero maintenance. And that's only the tip of the iceberg. What goes unsaid is that in EV applications electric motors practically last forever. The international standard for rating motor insulation is based on a half life of 20,000 hours. For every 10c increase in insulation rating life expectancy doubles. For example, the insulation systems of a class H (180c) motor that runs at 150c would lose half it's mechanical strength after 160,000 hours. Power electronic components such as those found in motor inverters are typically rated at up to 100,000 hours. To put that into context, with typical annual motoring of 15,000 km @ an average speed of 60 km/h, an EV motor will comfortably cover a minimum 1.2 million kilometres, or 80 years of maintenance free reliable motoring. No wonder auto dealerships hate selling EVs!